Cheetah speed is unmatched by any land animal. These cats can reach upwards of 70 mph. What makes them so fast? From a physical standpoint, it's easy to see that the cheetah is truly built for speed. 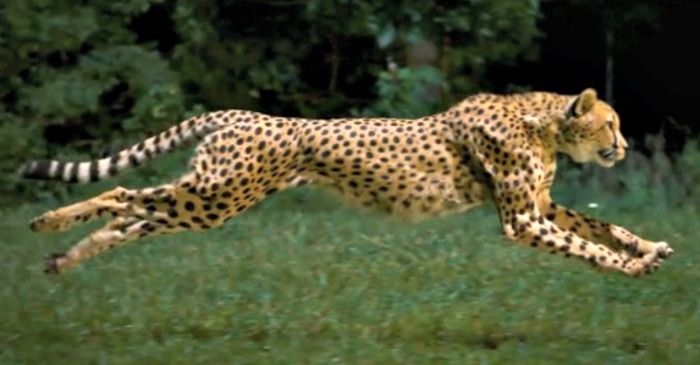 While the cheetah's top speed is more than impressive, it also accelerates at an incredible rate. They can reach 60 mph in less than 3 seconds. That's faster than you can say "Cat in the Hat" and much faster than most cars. For some comparison, I dug up some stats. Only the fastest cars in the world can keep up. On September 10, 2009, the Cincinnati Zoo's eight-year-old female cheetah, Sarah, broke a record, and reportedly became the world's fastest land mammal. She completed a 100 meter sprint in only 6.13 seconds. That was her second attempt, beating her first time of 6.16. Watch the Youtube video below to see both of Sarah's record breaking runs as she sets the land speed record for the 100m. There's talk of the times being submitted to Guinness World Records. In 2012, Sarah was at it again, this time running the 100 in 5.95 seconds. To anyone who watches any of the shows on cats on the Discovery Channel, Animal Planet, and so on the cheetah speed record for "fastest land animal" (in a sprint) is well known. It's probably also well known that their future as a species is uncertain, and they may face extinction. What may not be so well known is that cheetahs have been kept as pets and hunting companions. A number of famous figures in history kept cheetahs, including Genghis Khan. Let's not be like him. All that fast running requires a specialized body. The cheetah has larger nostrils, heart, and lungs in order to facilitate the oxygen needs of all that fast running. The long legs (cheetahs are tall cats), the long body, long tail, and the gallop all make high speed sprinting possible. Tough paw pads and semi-retractable claws make for better traction while running at "cheetah speed," and the long tail acts as a rudder to aid in turning. Cheetahs are the fastest runners on the planet. Combining the resources of National Geographic Magazine and the Cincinnati Zoo, and drawing on the skills of an incredible crew, we documented these amazing cats in a way that’s never been done before. Cheetahs aren't distance runners, like horses, for example. They get up to high speed quickly, run extremely fast, (hopefully) catch their prey, and that's that. They exert themselves so much that they often can't even eat their meal right away. They need to cool down first. Like house cats, cheetahs can purr on both inhalation and exhalation, but do not roar. This makes them technically not big cats, but some have classified them as a small big cat. An mp3 of a cheetah purring can be found on Robert Eklund's wildlife research page. More facts on big cats are at the big cat fact sheet. Big Cat Rescue's website has good information on cheetahs, of course, including taxonomy and sub-species information. They also have videos, photos and cheetah facts.